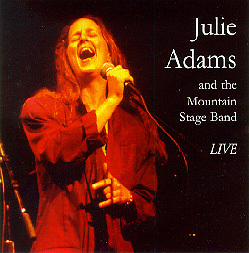 "Julie Adams and the Mountain Stage Band -- Live"
For the last 13 years Julie Adams has been the featured vocalist for the nationally-syndicated "Mountain Stage" radio show. Each week listeners are exposed to her skillful vocal interpretation of often-classic and sometime-obscure songs of various styles -- always backed by the crack musicians in the show's house band. This CD includes 11 outstanding cuts from more than 400 such performances.